NEW YORK, Feb. 21, 2018 /PRNewswire/ — HealthCare.com today announced the acquisition of Pivot Health, a rapidly growing provider and manager of specialty health insurance products, in an all-cash transaction. Founded in 2016, Pivot Health is led by an experienced team of insurance professionals with decades of industry experience and who have managed more than $7 billion of combined insurance premiums over their careers. Headquartered in Phoenix, Pivot Health develops, manages and markets proprietary, specialty health insurance products for individuals, including short-term medical, fixed indemnity and supplemental gap coverage. Additionally, Pivot Health expects to add to its portfolio of insurance products in the coming months. The company markets its products through a multi-channel approach, including, direct-to-consumer through its proprietary enrollment platform PivotHealth.com, through a network of independent licensed insurance agents and through selected online insurance brokers. Following the transaction, Pivot Health will continue to operate independently and focus on its current growth strategy. 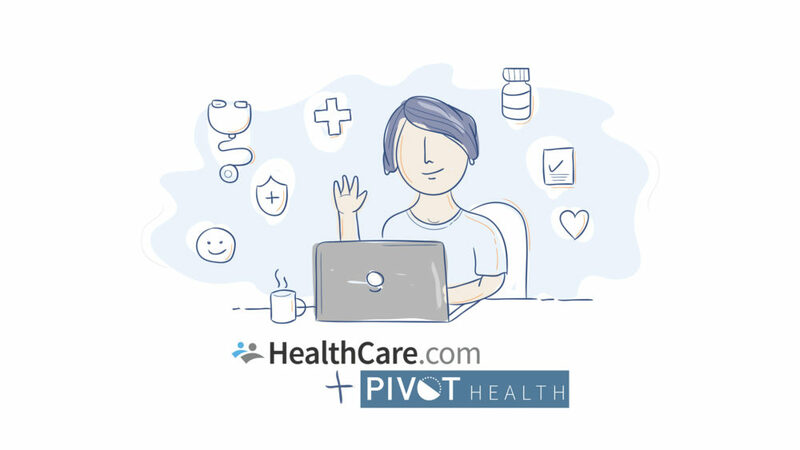 HealthCare.com will continue to manage its health insurance and Medicare comparison model that connects millions of consumers to brokers, carriers and call center partners, while finding opportunities to present Pivot Health products to interested consumers. The combined companies are uniquely positioned in the rapidly growing InsurTech space because they are able to leverage HealthCare.com’s technology and data-driven platform to help millions of consumers efficiently compare health insurance plans, costs and subsidies, and now – as result of the Pivot Health acquisition – directly enroll customers into niche and complimentary proprietary products through a consumer-friendly, end-to-end experience. Pivot Health was founded by Jeff Smedsrud, a veteran executive in the insurance industry with over 25 years of experience in entrepreneurship and marketing. Prior to founding Pivot Health, Smedsrud was a co-founder and CEO of HealthCare.com from 2014 to 2016 and previously sold four insurance marketing businesses to publicly-traded companies. Mr. Smedsrud will continue to lead Pivot Health on a day-to-day basis and will join the HealthCare.com management team. “Our combination with HealthCare.com brings substantial momentum and the right resources to serve consumers with the information they want, the comparisons they desire and products they need, all enabled by technology that makes enrollment faster and easier,” said Jeff Smedsrud, founder and CEO of Pivot Health. Pivot Health had previously received financial backing from AXIS Capital (NYSE: AXS), a Bermuda-based global provider of specialty lines insurance and treaty reinsurance. HealthCare.com received its initial financial backing from PeopleFund, a leading investor in consumer technology, and a group of successful technology entrepreneurs and investors. HealthCare.com is a privately-owned search-and-compare health insurance shopping platform that connects consumers with its network of licensed insurance brokers and insurance carriers. The website’s origins can be traced back to 2006, but launched as a new company in 2014 as a technology- and data-driven platform to help the American consumer efficiently compare health insurance costs and subsidies. The company ranked #148 on the 2017 Inc. 500 list of fastest-growing companies in America. HealthCare.com serves the individual health insurance market (providing quotes on both ACA and non-ACA plans) and the over-65 health insurance market (offering Medicare Supplement and Medicare Advantage coverage options). The company has helped more than 3 million people find healthcare coverage. HealthCare.com has offices in New York City, Miami, and Guatemala City. For more information, visit www.HealthCare.com/about. Follow HealthCare.com on Facebook, Twitter, or visit HealthCare.com/info. Launched in 2016, Pivot Health is an insurance product development, management and marketing company led by an experienced team of health insurance professionals that have managed over $7 billion of insurance premium. The company has proprietary products and dedicated relationships with several national carriers. The founders of Pivot Health have led previous firms that were acquired by NYSE listed companies. For more information, visit www.pivothealth.com.